How to follow:Listen on BBC Radio 5 live and BBC local radio; text commentary on the BBC Sport websiteTottenham boss Mauricio Pochettino says the Champions League quarter-final against Manchester City is one of his "most important matches as a coach".Spurs host Premier League rivals City in the first leg at the new £1bn Tottenham Hotspur Stadium. "To play in the Champions League quarter-finals is a massive bonus for us," said Pochettino. "We know it's going to be very tough. Manchester City in the last few years have been building to win everything. "Tuesday's game (20:00 BST kick-off) is the first of three matches with City - who are chasing an unprecedented quadruple - and Spurs this month. City boss Pep Guardiola said at the weekend it would be "almost impossible" for his side to win the quadruple this season.Having won the Carabao Cup, reached the FA Cup final and progressed to the quarter-finals of the Champions League, City are also chasing the Premier League title.However, Pochettino believes Guardiola's side are good enough to win all four competitions. "If one team is capable of winning everything it is Manchester City today," said the Argentine, who has urged his side to be "aggressive" in their second competitive game at their new home. "I think they know and he [Guardiola] knows that we are brave playing football, going forward, being aggressive and trying to be protagonists. "We are going to be aggressive and try to play and beat them." This is City's 52nd competitive match of the season and comes on the back of Saturday's FA Cup semi-final win over Brighton. "I don't know how fresh we are in our legs and in our minds," said Guardiola, whose side are unbeaten since 29 January. "In the FA Cup we could have been better. "Speaking about whether Tottenham's new stadium could be an advantage to the hosts, Guardiola added: "The stadium is what it is, the supporters support the team more than ever in the Champions League. "It's up to us how we handle it. We have to know how to handle the situations, if we don't that's because we are not prepared to go through." City forward Sergio Aguero, who has missed the last two games with a muscle injury, could feature after returning to training.Aguero has 29 goals this season, including five in the Champions League.Full-backs Kyle Walker and Benjamin Mendy should also be available.Tottenham will be without midfielder Eric Dier (hip), forward Erik Lamela (hamstring) and full-back Serge Aurier (hamstring).Forward Fernando Llorente is back in the squad after he missed out against Crystal Palace last week with concussion. 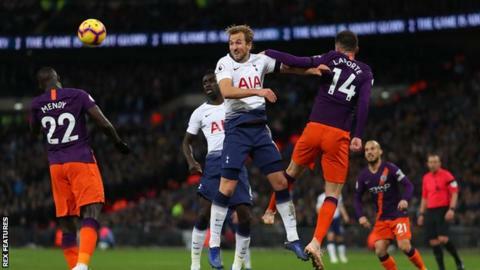 Simon Gleave, head of analysis at Gracenote, said: "The Euro Club Index gives Spurs around 27% chance of surprising Manchester City to progress to the semi-finals. "In terms of winning the Champions League, Tottenham's chance is currently around the 3% mark after being drawn against one of the best two teams in Europe on the ECI ranking. "Speaking about City's chances of winning the competition, Gleave added: "Manchester City are second favourites to win the Champions League according to the Euro Club Index, and are given around 20% chance of lifting the trophy in Madrid in June. "City are big favourites to win this all-English tie with 73% chance of reaching the semis." Tottenham have not faced an English team in a European competition since April 1973, when they faced - and were eliminated by - Liverpool in the 1972-73 UEFA Cup semi-final. Manchester City have lost all four of their European matches against English opponents, losing both legs of the 1970-71 Cup Winners' Cup semi-final against Chelsea and both legs of last season's Champions League quarter-final against Liverpool. » FA Cup quiz: Can you name the 14 finalists who are yet to win?